The best way to open the Pioneer Valley League cross country season is to remember the lollipop, so Colfax coach Shana Brown made it easy for varsity runners by passing them out Wednesday. Placerâs boys missed their second turn into the lollipop-shaped portion of the Colfax cross country course last year, so Brown distributed ceremonial lollipops to avoid another disqualification in 2016. With the course layout fresh in their minds, Placer boys and girls sped to remarkable times on the 5-kilometer course. 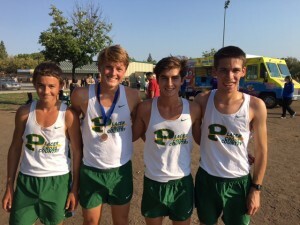 Placer also swept frosh-soph scoring, thanks to big runs by Kelsey Griffin, Devin Muzzy and Brendan Moley. The boys squad saw terrific runs by Ryman Crone (first, 17:45), Jesus Reyes (second, 18:07), Jesus Carrasco (third, 18:27), Riley Black (ninth, 18:59) and Wesley Moore (10th, 19:07). âIâm very happy with PVL No. 1,â Placer coach Randall Fee said. âItâs the first time you get to see all the new faces and you never know who you will match up with.